Our open spaces are so vast that traveling on foot is often not the fastest way into the heart of a preserve. Sometimes you’ve just got to ride. And we’re lucky to live so close to many of the best bike routes the Bay Area has to offer. They allow us to coast through alpine meadows, climb through redwood forests and cruise along the coast’s rich farmland. 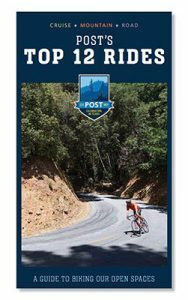 In our new Top 12 Rides Guide, we share our favorite cruises, mountain and road rides across the Peninsula and the South Bay. We’ve got you covered with maps, elevation profiles, route descriptions and much more. These rides are beautiful because they take you through POST-protected lands of all types, making them not just good for your body, but great for your mind too. And now there is even more protected open space to enjoy on the coast. Last week we protected one of the last remaining family farms still operating within the city limits of Half Moon Bay. The property’s 18.53 acres of rich soils and its historic barn are now safeguarded for future generations to enjoy. We’ve now protected six farms through our Farmland Futures Initiative. Read the full story here.